So, for the happy ending part…a big box appeared on the back porch, shortly after lunchtime. I only mention the lunch part as I decided to check out an oyster and opened the bag marked Shigoku. 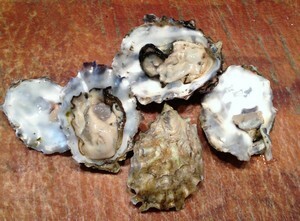 Shucked one and ate it with a squirt of lemon. That was really good, so did a second and then a third. 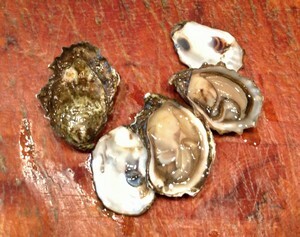 Mild, a little briny, these were the first Shigoku’s I’d ever tasted and they made a fine dessert! One of the things you learn about oysters (and to a degree, steak tartare) is who your friends are. 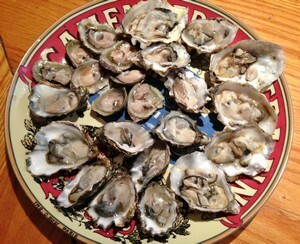 Having a plethora of oysters is great, however, having this many requires friends to help share the wealth. 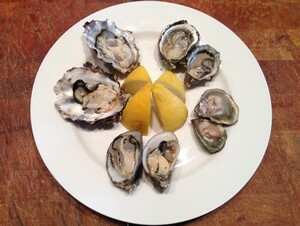 If they have shucking skills, even better! It turned out to be a good excuse to have my parents come out, as they have both a love for oysters and, in the case of my father, good shucking skills (and his own oyster knife) and our friends, George and Jean, were happy to come and indulge. Another thing I learned after shucking a bunch of oysters, is that the shuckers really get the bad end of the deal. It is much faster to eat oysters than it is to prep them, and around my friends and family you have to be really quick to pounce once they hit the table! Otherwise, turn your back and they’re all gone (sob, sob). 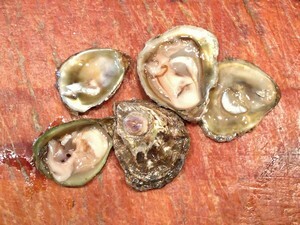 Shucking oysters is one of those messy jobs that has a lot mystique to it, but is actually a pretty simple procedure. 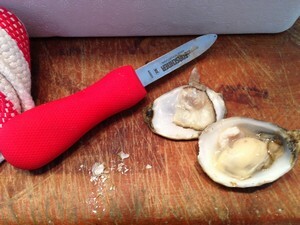 All you do is stick an oyster knife into the hinge of the oyster, jam it around until the oyster gives up, run the knife across the top of the shell to remove it and if you’re like me, cut the muscle so you can slurp them up faster. The four varieties Jon sent were very different. All of them were smaller than East Coast oysters, with the Olympia’s being the tiniest-slightly larger than a big jacket button. The biggest were the “extra-small” Pacifics, which were probably about 3” long. The other difference was that their shells (except for the Olympias) were much deeper, than say, Wellfleet oysters, which tend to be flatter. But how did they taste? None of them will kick the Virginicas off the #1 spot on my list, but the Olympias were my favorite of the four varieties and a strong contender for #2. A little bit of a smoky flavor, these were tiny bites of pure pleasure. 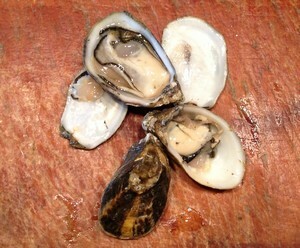 Kumos have always been delicious and the Pacifics were nicely meaty and briny. For me, the Shigokus were a little bland, but are probably a great starter oyster (if you’re not used to eating them on the half-shell). And for the real happy ending? Taylor Shellfish has a fan (or six) for life! 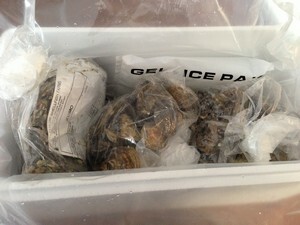 I wouldn’t hesitate to order oysters from them for a party (or just a treat). It made such a difference that they were all so fresh-plucked from the Pacific a mere day before they ended up on my back porch. We made some mignonette (finely minced shallots and red wine vinegar), usually my must-have for oysters, but these were so pristine they barely needed even a squirt of lemon. So, figure out who your oyster-loving friends are (I’m available! ), call Taylor and enjoy! Many, many thanks to Jon and the rest of the people at Taylor for putting a smile on my face for a whole week! Great people making a wonderful product!